Spoilers near the end, but there’ll be another warning first. This entry was posted in Everything, Reading Books and tagged Barking Back, book review, books, fiction, Lisa Samson, The Sky Beneath My Feet, women writers on 23/09/2016 by nissetje. It’s hard for me to decide whether or not I liked this book. I think partly that’s because I don’t know exactly what it is. Is it autobiography or fiction or memoir or fantasy or love letter? I feel as if it is important to know if it is factual or invented, even though “factual” memoirs or autobiographies can easily contain lies or falsifications or dramatic enhancements. But for some reason, it really bothered me to not be able to tell where Heti was telling the true story, and where she made things up or altered them to be true to the story, if that makes sense. This entry was posted in Everything, Reading Books and tagged Barking Back, book review, books, fiction, Sheila Heti, women writers on 20/09/2016 by nissetje. After a long reading hiatus (as in a hiatus from reading, not a hiatus in which to read), I was suddenly in the mood for a book again. Something easy, something fast, something maybe a bit on the sci-fi side. I’d picked up a pile of books from my uncle in Steinbach after the Pride Parade, and Flashback was the hardcover supporting the stack. 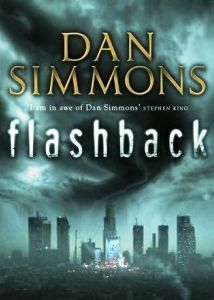 This book is set in a dystopian not-too-distant future in the United States of America in which that country and indeed much of the world has broken up into warring factions, and in which many people are addicted to a drug called Flashback which allows users to fully relive the memories of their choice. As I’ve mentioned before, I am a big fan of dystopian fiction (dystopian reality is a whole different thing!) so I flipped it open and gave it a go. This entry was posted in Everything, Reading Books and tagged Barking Back, book, book review, fiction on 02/09/2016 by nissetje.